John 'Roothy' Rooth detours to the Kimberley, home of the shapely boab tree. In his trusty old Toyota called Milo, John ‘Roothy’ Rooth has traversed much of Australia’s most remote country – accumulating tall tales of adventure, mishaps and ingenuity along the way. In his book Out of Range, he showcases seven of this country’s most iconic four-wheel-drive trips, offering tips and shortcuts (and occasional long-cuts) through crocodile swaps and sandy deserts, over snowy mountains and sun-drenched beaches. In the passage below, Roothy heads west to the Kimberley, and shares a Dreamtime story of one of the region’s emblems. The Kimberleys? For most of us, it’s a hell of a long way just to get there. And when you do, everything you want to see is going to involve heaps more travel too. So it’s not the sort of place anyone should go if they don’t enjoy a bit of distance driving. Which must make me some sort of masochist because I’ve never been there in anything more comfortable than old Milo, or hanging off a motorbike. When it comes to features, Milo’s got two more than the average trail bike: foot flaps and an ashtray. If a bloke still smoked that’d be lovely. You know you’re heading Kimberley way when you make that west turn onto the Victoria Highway at Katherine, four hours short of Darwin. A couple of hours of fairly boring grasslands and then suddenly the country takes a dive down into the Victoria River valley. Everywhere you look you can see the wear and tear of millions of years of wet-season floods, from the carved red-rock escarpments to the flood plains below. Big gums take over from the scrub. This is our country with the contrast turned up to full. It’s also boab country, those big pregnant-looking trees with their swollen bellies and just-got-out-of-bed hairstyles. Aboriginal people have got a great yarn about boabs. They call them Larrkardiy trees and they’re a big part of the culture because the inner pulp holds moisture even in the driest times and it’s wrapped in fibrous bark that’s useful for fishing nets. The seed pods make a sharp-tasting drink that’s rich in vitamin C and they don’t make bad cups when they’re dry either. If you’re desperate, the leaves are edible, as are the roots of boab saplings. I’ve heard that you can make an intoxicating drink out of the sap, too, but a couple of licks of the raw stuff put me off any thought of trying that. 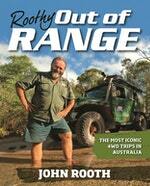 Australia’s favourite bush mechanic takes you ‘off road’ and ‘out of range’ on the best 4WD adventures in Australia.